The seal islands of Alaska are four in number, two of which, however, are mere rocks, and of little or no importance com­pared with the others, St. Paul and St. George, the former of which is the great seal ground of the northern hemisphere, and without a parallel at the present time on the face of the globe. This little island lies in latitude 57° 8" north, longitude 170° 12' west, and is visited annually by over five millions of fur seals; while St. George, lying to the southeast, only twenty-seven miles from St. Paul, is resorted to by less than two hundred and fifty thousand, the nature of the coast, high, bald, and bluffy, not permit­ting the breeding seals to lie upon the beaches in safety. The other two unim­portant islets—Otter, five miles south of St. Paul, and Walrus Island, six miles east of the same—are not unworthy of mention, es­pecially the latter, upon which herds of hundreds of immense bull walruses can be view­ed to the greatest advantage at all seasons of the year, in company with clouds of breed­ing water-fowl. On these islands the fur seals can come from the cool water of Behring Sea, and rest, without inconvenience or annoyance of sun­light, which rarely breaks through the fog-banks peculiar to this latitude. So uncom­fortable are these animals made by heat that a few hours of sunshine, with the tempera­ture as low as fifty degrees in the shade, will drive nearly all of the non-breeding seals back to the water, and cause those that re­main to pant, and resort to various move­ments of their flippers in order to cool them­selves. But the humid fogs quickly regain their ground, and with them the seals also. The certainty of a cool, foggy summer, cou­pled with the perfect isolation of the islands, gives rise to the preference manifested by the swarms of pinnigrades which come to them, to the practical exclusion of all other land in the northern hemisphere, small fur seal rookeries only being found on Behring and Copper islands, lying to the westward, which are, however, owned and under the jurisdiction of the Russian government. The Pribylov Islands were discovered by the Russians in 1786-87, and colonized by them immediately. The colonists taken by the Russian American Fur Company to these islands as servants and workmen were prin­cipally Aleuts from the settlements on the island of Oonalaska, and were provided with a priest, being all members of the Greek Catholic Church. This colony of one hun­dred and thirty-seven souls had, at the time of the transfer of the Territory, increased to two hundred and seventy men, women, and children. These people were, as they are now, simple and docile, being excessively devoted to their religion, having, however, a lamentable weakness for intoxicating drink; and although liquor is wisely prohibited by law, yet elsewhere in the Territory, and to some considerable extent here, the natives evade the restriction, and frequently be­come intoxicated on a species of beer which they brew from sugar, flour, rice, etc. Were they not under any legal restraint, they would live in a continual state of debauchery. After the transfer of the Territory several parties, who were or became aware of the im­portance and value of the seal life on these islands, immediately fitted themselves out for the sealing business, and came promptly upon the ground; and had no limitation been imposed upon them by the govern­ment and a member of their own fraternity, the great " rookeries" would have been swept from the islands. The wise adoption by Con­gress of the leasing principle, now control­ling these interests, has preserved this grand exhibition of wild life in all of its marvelous features. 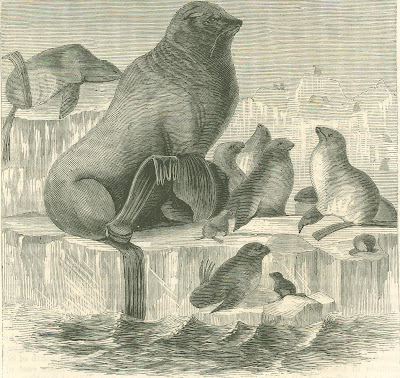 This lease of the seal islands was granted July 1,1870, to the Alaska Commer­cial Company of San Francisco for a term of twenty years, upon the faithful fulfill­ment by the company of all conditions spec­ified in the lease. The wealth of the seal islands has thus drawn to its care and conservation the best thought and energies of a number of the leading business men of our country, who are sharpened into the keenest oversight by the heavy risk taken annually in shipment and the fluctuating price of the raw material in the market. The company has employed honest and experienced agents for the man­agement of its affairs on the islands. Fortu­nately for the people of Alaska, this company has found it necessary, though not imme­diately profitable, to spread its stations over the whole Territory, wisely recognizing that the best interests of the natives and the gov­ernment are identified with its own. But for its guardianship whisky trading and de­bauchery would bring to the lowest degra­dation the simple natives of Alaska. No whisky trader can go to any native village in the Territory without coming in contact, sooner or later, with the agents of the Alas­ka Commercial Company, who will at once notify the revenue officers, and suppress the nuisance, thus keeping the people sober and quiet, saving to the government millions of dollars, which would have to be expended in supporting troops throughout the Territory for the suppression of Indian outrages. The people belonging to the islands are by the terms of the lease permitted to reside there to the exclusion of all others, and are alone allowed to participate in the labors and rewards of the seal traffic. The systematic and regular routine of the lives of the fur seals upon these islands near­ly six months of every year, the long fasting of the males on the breeding grounds when presiding over their harems of from ten to twenty females, which are strangely disproportionate in size, cannot fail to draw the attention of the most casual observer. With the clearing away of ice and snow come the first seals of the season, usually by the 1st or 2d of May. All these early arriv­als are males, full grown, which anticipate the coming of the females even six weeks in advance. Thus, by being first upon the ground for the season, they are able to choose their locations without much difficulty, upon which each is to receive his family. From the time the male comes out and takes his position upon the rookery ground until he leaves it at the close of the season—a period usually of a little over three months —he takes no food or water, and never for an instant, unless driven away by superior force, leaves his ground, which is about ten feet square in area. The subsistence of fur seal males for three or four' months without eat­ing, while engaged in the most violent exercise, combined with the greatest vigilance, is marvelous, for they do not stagnate, like bears, or similar hibernating animals. None of the other classes, the cows, young males, and pups, sustain any protracted fasting, the cows feeding every two or three weeks, at least, while the young males and yearlings of both sexes seldom stay upon land more than a week or ten days at any one time. The males fight desperately, even to death, for their positions on the rookeries, the com­batants, with teeth clinched in each other's hides or flippers, struggling in savage though alert unwieldiness, their roars of rage and defiance being half stifled by the violence of the conflict. The females are, however, exceedingly ami­able in disposition, and are only about one-fourth the size of the males, which will weigh from three hundred to five hundred pounds early in the season, having six to seven feet of length. The females weigh on an aver­age eighty pounds, and measure four feet in length. The bodies of these animals are covered with two coats, one of short, coarse over-hair, and the other a soft, close, elastic fur, which is completely concealed by the former. The prevailing color among the males on the breeding grounds is a rusty brownish-black, with a dark gray or rufous-ochre patch or "wig" over the shoulders, while the females show shining steel-like tints on the back, with pure white on the inferior parts. This beautiful coloring, however, soon fades, by exposure to the weather, to a dull rufous-brown and gray. From the 1st of June to the 14th the fe­males begin to make their appearance, and afterward, up to the 8th of July, they arrive by thousands and tens of thousands, landing in obedience to some subtle instinct, without the disorder or confusion which might be sup­posed to exist among such numbers. With­in the short period of three weeks acres of ground are fairly packed by these animals as closely as they can lie. They are stimu­lated to land by the expiration of the period of gestation, for soon after coming ashore, usually within a day or two, they give birth to their young. How nicely these faultless animals must time and direct their long sea journey back to these islands? - for they go in quest of food two and three thousand miles away. The fur seal nev­er sprawls out and flounders when moving on land, as might be supposed from ob­serving the progres­sion of the common hair seal; on the contrary, this ani­mal carries its body clear and free from the ground, with head and neck erect, stepping forward with its fore-feet, and bringing the hinder ones up to fresh position after every second step forward. When exerting itself it can spring into a lumbering, shambling gallop, and for a few rods run as fast as a man, but will sink quickly to the earth, gasp­ing, panting, and palpitating. In the water all movements when swimming are quick and swift, the fore flippers propelling, and the long, attenuated hinder ones serving to guide the course. The animal always in traveling swims under water, ever and anon rising, with head and neck clear from the sea, to snort and survey the field. The seals will frequently, when in play or suddenly startled, leap from the water like so many dolphins. The young seals are exceedingly frolic­some at sea (as also a great part of the time on land); running acrobatic races in the surf, chasing one another, and whirling in swift circles, they seem to be brimful of warm, joyous life. They also delight, especially the old ones, in lazily turning over and over in the swell, scratching and rubbing them­selves with their flippers, exposing as they float in the water but a small portion of their bodies; and they also sleep upon the surface in the same short, uneasy slumber so characteristic of them when on land. There is nothing dull or lethargic about the fur seal when asleep or awake. A healthy seal is never seen sleeping without an involun­tary nervous muscular twitching and flinch­ing of various portions of its body, usually an uneasy folding out and back of its flip­pers, with quick crawling movements of its skin, the eyes being, however, always tight­ly closed. "The web-footed seals forsake the stormy swell, and, sleeping in herds, exhale a nauseous smell." The perfect order and systematic routine followed by the fur seals upon their breed­ing grounds, year after year, as seen upon the Pribylov Islands, is a wonderful exhibi­tion of instinctive sagacity. Over twenty miles of the shore line is occupied by these animals as breeding "rookeries" and " haul­ing grounds," the latter term signifying those places where the non-breeding seals are compelled to go, since all of the young males under, and many over, six years of age, together with the yearlings of both sexes, are driven from the rookeries by the older and stronger males there. Less than three-tenths of the males born are able to maintain themselves on the breeding grounds, so that a large margin of surplus male life is left in reserve, and constitutes the chief population of the "hauling grounds," from which all drafts are made for killing, as the females are protected by law from disturbance. Thus, though a hundred thousand young bulls are killed annually here, out of some three or four hundred thousand yearly born, yet a large surplus margin of male life is still left, and not the slightest injury is done to the integrity of the seal life and its perpetuation. But no legislation on the part of man can in the slightest degree promote the increase in number to any noteworthy degree of these valuable animals, since they are not within our control, and consequent protection, from the known, and probably many unknown, deadly enemies which prey upon them, upon the young especially, thus limiting them to their present maximum number. The cow seals, after coming up on to the rookery and giving birth to their young, seldom remain long at a time without visit­ing the sea, both to feed and to wash, leav­ing the pups on their rocky birth-places. The cows suckle their offspring at least ev­ery three or four days, the little fellows gorging themselves, as a rule, so as to be for many hours after nursing almost inca­pable of moving. They do not seem to know their respective mothers, who, however, nev­er permit any but their own to suckle. The pups are droll little animals, full of fun, and very fond of getting together in large squads, all the way up from a hundred to ten thousand, to frolic and gambol among themselves, until a common impulse leads them to sleep. By the middle of August those of them that may be nearest the water essay to swim, for a fur seal pup's first at­tempt is most laughably awkward, and did it not begin in some shallow eddy near the shore, it would certainly drown; but while the little animals ark ridiculously clumsy at first trial in the water, they continue to splutter, flounder, flop, and paddle in and out until, by the time they are ready to leave the islands, in October and November, they can move with great freedom, and at the age of one and two years they become the champion swimmers of their species. A walk of half a mile down from the vil­lage to the reef on St. Paul Island any time during September will carry you to the pa­rade grounds of over two hundred thousand pups, among which you can slowly make your way, while they clear out from your path ahead, and close again in your rear, you only interrupting them in their sleep or at play for a few moments. This reef ground in September and early October is a strange spectacle, as you walk through legions of semi-indifferent seals, some timid, others boldly defiant, though all give you room enough to move safely over the length and breadth of the mighty breeding ground, the summer haunt of a million of animals universally deemed wild, yet breeding here undisturbed by the close proximity and dai­ly visitation of man; creatures which will fight one with another to the death rather than forsake their stands on the rookeries, will yet permit you to approach them to within almost reaching distance without injury; old bulls which will die before they will leave their posts, yet lie down and sleep while you stand by to sketch or observe them scarcely ten feet distant. No other wild animals in the brute world will permit this immediate attention from man. The great cowardly sea-lions, the big lumbering walruses, leave-their offspring at slight alarm, and retreat precipitately to the water; the presence of human beings is the signal for speedy departure from their breeding haunts; but the fur seal breeds within a pistol-shot of the villages on St. Paul and St. George islands, and in full sight, and is in no way whatever concerned if not purposely har­assed or driven from its position. From the windows of the Government House on St. Paul Island one can view the movements and listen to the cries of fifty thousand breeding seals and pups at any time during July, August, and September, as they lie on the lagoon spit, less than a quarter of a mile away, and in the same field of vision see the killing gang at work slaugh­tering and skinning, not much more than fifty yards away from the indifferent ani­mals on this lagoon rookery, which are only separated from these men busy in their bloody labor by a small stream of tide-water. 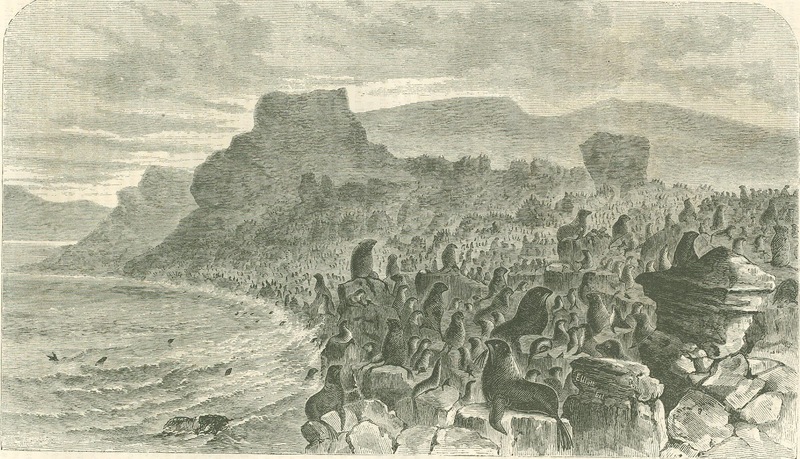 The capturing, driving, killing, and skin­ning of the fur seals is done entirely by the people of the islands, who carry on this busi­ness rapidly and skillfully, and who are alone, by the terms of the lease, permitted to participate in this labor and share its re­ward, so long as they shall of their own free­will be equal to its proper execution. The number of seals taken annually is re­stricted to one hundred thousand young males, not under one year of age, and policy prevents the killing of any bulls at or over six. 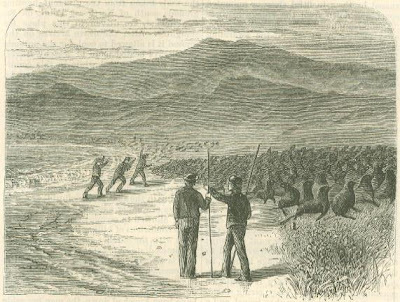 The time chosen for taking the season's quota is from the date of their first arrival in June up to the shedding of their coats in August; and last year the whole hundred thousand were taken in less than thirty-three working-days by the natives, who receive forty cents a skin, thus dividing $40,000 ev­ery year among themselves, or a little over $400 to each working-man and boy. This price per skin, which is an advance of thirty cents over that given by the Russians, is also fixed by law. The company sells to the natives an extensive assortment of goods, embracing all the necessities of life and many of the luxuries, at the wholesale prices of the San Francisco market; and as all wid­ows and orphans are cared for and support­ed voluntarily by the company, it will be seen that these people are better off than any similar class of working-men in our country, or perhaps in the world. The seals are easily captured; their cap­tors, the natives, reminding one of butchers as they go into a stock-yard to select and drive out a batch of bullocks, for the meth­od of procedure is precisely similar. To the right and left of the breeding grounds stretch sand-beaches, or some con­venient landing, upon which the "hollus­chickie," or the bachelor seals, lie by tens of thousands, extended in every attitude assumed by them in fitful sleep or animated sport, and down from the village to these " hauling grounds" come the natives, who, after making a survey of the swarming myriads, step in among them and turn aside from the masses two or three thousand of the most eligible animals, usually males of not over four years old and not under two. This drove which they have selected is driven to the village as a flock of sheep would be, the animals moving in a succes­sion of sudden starts, with frequent resting spells, at the rate of about half a mile an hour, provided the weather is cool and foggy and the ground hard. Seals can be driven at the rate of a mile an hour under peculiarly favorable conditions of road and weather; but the loss of life is great in a large drove, so many falling senseless, gasping and pal­pitating, some to rise again within a few hours, and others dying at once. Only four or five men are required to cap­ture in this way a drove of from one to even fifty thousand, did they ever want so many; and the labor of driving them overland to the salt-houses near the village is light, as the seals move without resistance and re­quire but little urging, only it should be constant and gentle. They string them­selves out in long files as they travel, and a drove of four or five thousand will stretch over a path more than a mile in length. The killing grounds are in full view from the village, being a low sand field but slight­ly elevated above the level of the sea. All the seals taken from the different hauling grounds south of Northeast Point, on St. Paul Island, are driven to this place for slaughter. After the drove arrives on the ground it is allowed to cool, for the animals are always heated more or less by travel, and if they are killed while in this condi­tion their hair and fur fall off or can be easily pulled out. During the delay a man is put in charge to herd and keep them to­gether on the field. 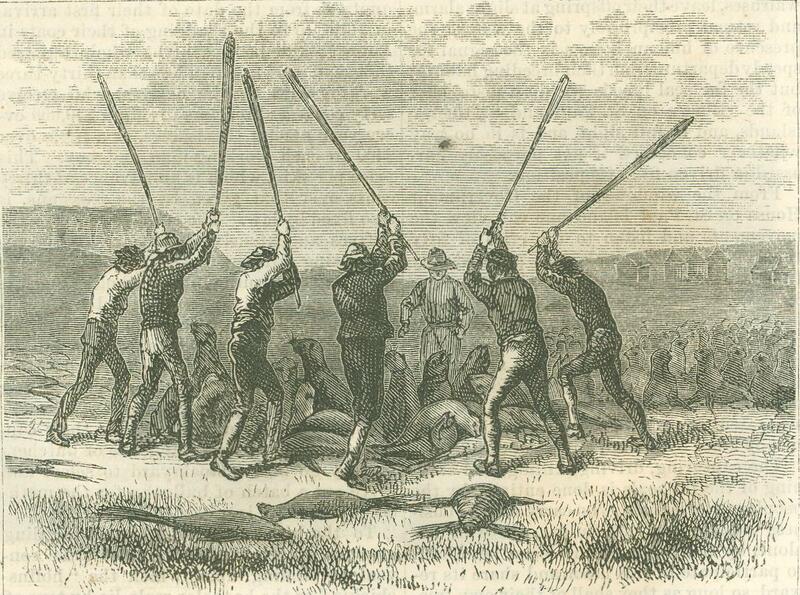 When the seals are ready for killing, fifteen or twenty men come down from the village, armed with long heavy clubs of hard wood. They drive out to one side fifty to a hundred seals from the body of the drove, surround them, causing the seals to huddle up in a writhing, struggling heap, and strike them lifeless by well-directed blows upon the head, crushing in the skull, the ineligible animals, such as are under age or in bad condition, being allowed to escape; and in order that these conditions of killing may be fully complied with, the butcher gang is always under the immediate supervision of an overseer, who is always with the men directing their movements. In this way the whole number of eligible seals in the drove is disposed of during the day. After three or four hundred have been knocked down, the men lay aside their clubs, and immediately set about the work of skinning, for if the day is a little warm the carcasses will heat and blast in a few hours, so as to injure the quality of the skin. The natives become very expert in the labor of skinning, some of the leaders taking the hide neatly from the body in less than two minutes; but the time averages from four to five minutes. The skins are taken up to the salt-houses of the company, where they are spread out on benches or bins one upon the other, with salt profusely sprinkled over and on the fleshy sides, which are turned uppermost, and after lying in this pickle for a week or two they are taken up from the bins, and bun­dled, with fresh salt scattered over, for shipment. Upon these skins the company pays a tax of $2.50 per pelt, or $250,000 annually, together with a bonus of $50,000, making, with other small items, a revenue from these islands of over $300,000 net. The hide in a natural condition differs much in appearance from the dressed skin, for in the process of preparation for ladies' and gentle­men's use the over-hair is plucked out, and the fine, close, soft, elastic fur is dyed to a rich dark brown, being originally a light brownish-yellow or ochre. This art of prop­erly dressing seal-skins is possessed by only two or three furriers, and one company, which is formed for this especial purpose, having its head-quarters and working-rooms in London. The Pribylov Island skins in their raw or natural condition are at present all sold in London, and brought on an average last year from $6 to $10 each, but after being prepared they are sold for from $15 to $40. The great secret of dressing them lies in the art of dyeing the fur cleanly and uniformly. By the end of October and toward the middle of November the great body of the seals will have taken their departure for the season, while small straggling bands will stay even into January, until driven off by ice and snow, on which they are averse to lying. From the time these animals leave the Pribylov Islands in the fall until their return to them in the following spring they do not visit land, but pass down south, and out over the vast expanse of the North Pa­cific, where they fish and sleep, and lead a generally free and easy life. Large numbers of them are seen in the many channels and rocky fiords of the northwest coast, as far down toward the equator as the mouth of the Columbia River; and although they sleep and feed for months at a time in and about the narrow canals, yet they are never known to land, or even to bask upon detached and water-washed rocks. If they are surprised soundly sleeping on the swell, they may be approached to within short rifle range, and in this way the natives on the coast annually secure several thou­sand. Among the many singular traits of char­acter possessed by these animals none are more striking than the devotion of the male to the offspring, contrasted with the apa­thetic attention paid by the mother. The latter will at the least alarm bolt away into the sea, leaving the pup behind her; but the bulls mount guard over the swarming herds of young, and nothing can exceed their de­votion and courage when called upon as protectors. By the middle of September, however, when the pups are pretty well grown and all familiar more or less with the water, this careful attention on the part of the bulls is withdrawn, and all supervision on their part is over for the season. The external ear of the fur seal is very small, and instead of being open, as is usu­al with all other mammals, it is rolled up on itself so as to present a scroll-like structure, not unlike in shape and size to the little finger on the human hand cut off at the second joint, only a trifle more conical, being much greater in diameter at the base. The seal seems to have no power to elevate or depress his ears, as a dog or cat can, but from their shape it is evident that they serve to protect the internal ear from the water pressure should the animal dive deeply and stay down long in quest of food or to avoid enemies. The sense of hearing is exceed­ingly keen, and although by taking great care a seal may be approached while asleep near enough to touch it without its notice, yet the least noise will arouse the animal, which will rise with a single motion, erect, and look confusedly around for the cause of the disturbance. If it is an old bull, it will roar at the intruder in loud, prolonged, angry tones; if a young male or female, it will snort with amazement, and immediately shuffle off to a safe distance. 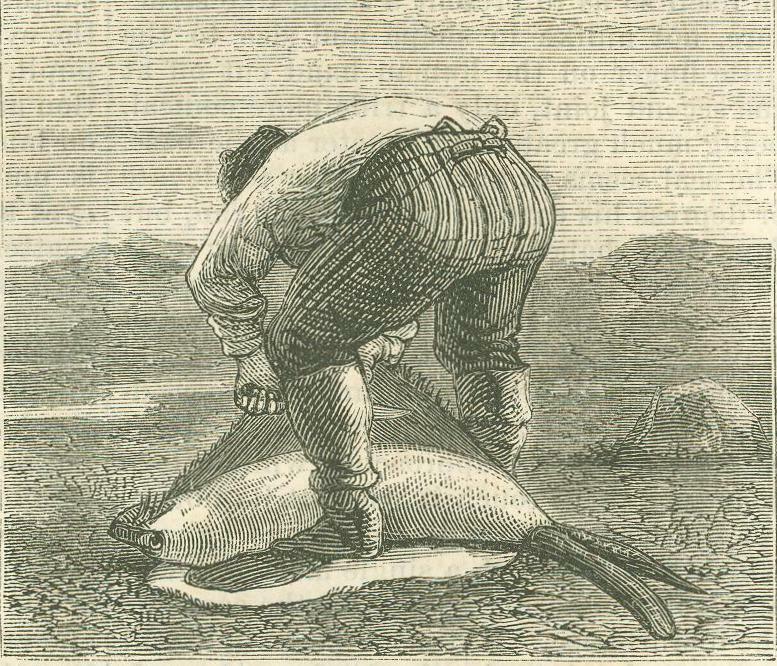 The natives, especially the youth, consider it great sport to steal up softly on a sleeping seal until they are near enough to seize one of its long white mustache bristles, and suddenly, with a quick wrench of the hand, jerk it out, jumping back at the same instant, having a most prudent regard for their own safety. The sense of smell possessed by these an­imals is well developed, and will always awake them from sleep, even if you come ever so quietly to the windward of them; and you will alarm them in this way much more thoroughly, though you are half a mile distant, than if you came up carelessly from the leeward, and even walked in among them, they seeming to have some idea of your being not different from one of their own species until they smell you. The muz­zle of the fur seal is very similar to that possessed by a well-bred Newfoundland dog, the upper lips not being flabby or over­hanging, as in the case of the latter, while the whiskers are fifteen or twenty long, stout, whitish-yellow and gray bristles on each side, about as thick as a good-sized knitting-needle, varying in length from five to fifteen inches, for they—the bulls—all break and tear them out in fighting one with another; this mustache droops down and lays back against the side of the head and neck. If they possess the power, they do not often use it, of moving these "feelers" for­ward and backward, as we see cats do, and other animals similarly embellished. But the chief attraction in these highly organized animals is their large, handsome eyes, which seem to indicate great intelli­gence; the color is through all classes and ages a deep bluish-black, with a soft glisten­ing liquid appearance. When the animal is very much heated in fighting, or immedi­ately after being struck senseless by a blow on the head, a lurid green light is seen to supplant the normal color of the iris, giving the eye a singularly fierce expression. The pupil, like the cat's, is capable of great dila­tion and contraction. Their power of vision on land does not seem to be acute, while it is undoubtedly very keen in water. The eyes are sensitive and easily affected; the spattering of sand by rain makes them very sore and painful to their owners ; so that during the prevalence of any of the frequent rain-squalls occurring on the islands, most of the non-breeding seals, or holluschickie (bachelor) seals, take refuge in the sea, com­ing back again immediately after the cessa­tion of rainy weather. One of the most marked features on the breeding grounds is that a large percentage of the bulls there holding positions have but one eye toward the close of the season's la­bor, the other having been lost in fighting. 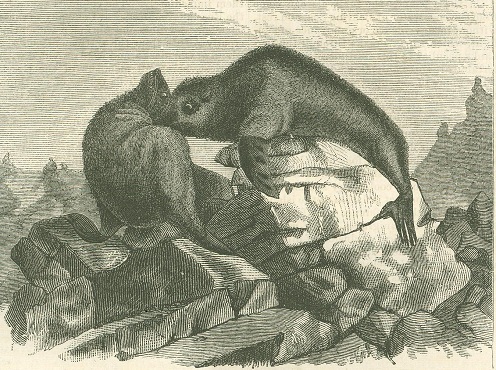 The tail of the fur seal is very much out of proportion to its owner's bulk, as is that of the bear, only it is even more insignifi­cant; indeed, it is not easy to see why it should have a tail at all, for it is not called upon to fight flies even as Bruin, nor does it want a rudder while in its most nat­ural element, since it steers its course with precision and ease by the hind flippers, which are long and slender, not having more than a mere tithe of the strength which lies in the fore-hands. These fore-hands are very strong, enabling the seals to leap from the water like flying-fish, describing arcs of ten to fifteen feet in the air, and this they inva­riably do when suddenly alarmed, and often when playing. They must be able to catch fish without much exertion, and are gorged with food most of the time when away from the islands, for the waters of Behring Sea and the North Pacific are rich in pisca­torial life. They do not appear to eat the heads of large cod-fish, for I have picked up quite a number of fish heads which had been bitten off at the nape by these animals as they were cast up on the beach by the surf, showing a very judicious dislike to the horny mouths filled with rasping and needle-like teeth. They also vary their main diet of fish by a selection of the most juicy and tender fronds of kelp or sea-weed, which is also very abundant, and an occasional soft crab. The five and six months old pups, how­ever, when they leave the islands in Octo­ber and November, must have to exert them­selves somewhat to obtain food, for they are not at that time very expert or swift swim­mers, and when they come back to the isl­ands next year in July they are no heavier, though they have gained from five to seven inches in length. The pups cannot suckle their mothers in the water; at least they have never been observed to do this. 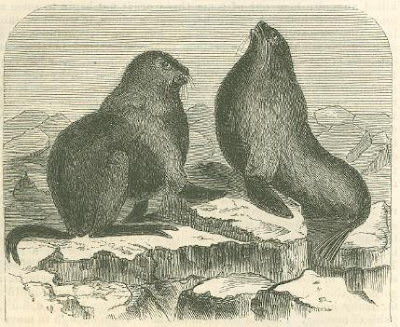 Although the fur seal has the thickest and most comfortable coat of hair and fur pos­sessed by any of its species, yet it does not like to be upon snow or ice, nor will it ever be seen floating about on ice-floes like the sea-lion, hair seal, or walrus, which are all devoid of the additional protection of fur. The writer has heard and read many sto­ries in regard to the catching of water-fowl by these fur seals and their cousins, the sea-lions; but around these islands, where innumerable flocks of sea-birds breed and rest upon the water not a single instance has been observed in which the thousands of gulls, ar­ries, etc., sitting about on the swell, were dis­turbed, although the dark, shooting forms of swimming seals were constantly seen below them. A great many amusing and ridiculous ar­ticles have been published upon the habits of this most interesting and sagacious creat­ure. Even Steller, who was the first to in­troduce the northern fur seal to naturalists, has been the author of much in his paper upon it that is, to say the least, romantic. He says, for example, that "the males show great affection for their young, and are some­times tyrannical toward their females. They are fierce in protecting their offspring, and should any one attempt to take their cub, they stand on the defensive, and the mother carries it off in her mouth. Should she hap­pen to drop it, the male instantly quits the enemy, falls on her, and beats her against the stones till he leaves her for dead. As soon as she recovers she crawls to his feet in the most suppliant manner, and bedews them with her tears, while he keeps stalking about in the most insolent manner; but if the cub is carried off, he melts likewise, sheds tears, and shows every mark of deep sorrow!" 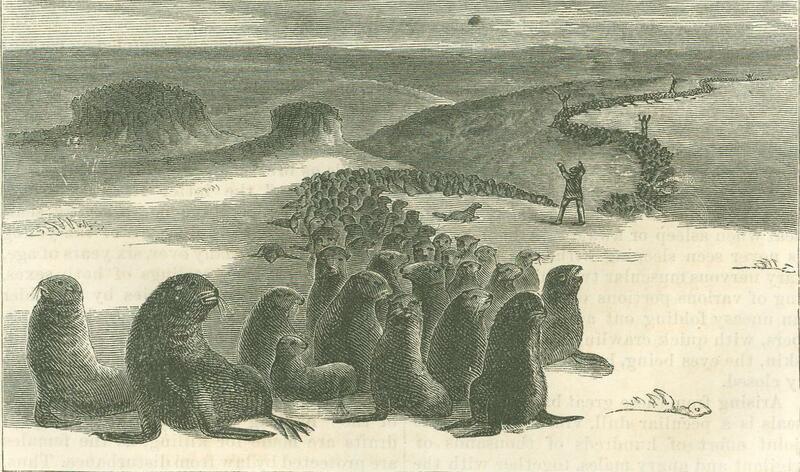 Very few seals among the tens of thou­sands on the Pribylov Islands die a natural death there. Most of the bodies left by them when they depart in the fall were animals which had received severe wounds in com­bat on the breeding grounds, while a dead cow is scarcely seen upon the whole expanse of the rookeries over which they swarm dur­ing the summer season. Large numbers, however, of the pups, especially when quite young, get crushed and trampled to death when the bulls are fighting; but still the loss, in comparison with their whole num­ber, is slight—not over two per cent. 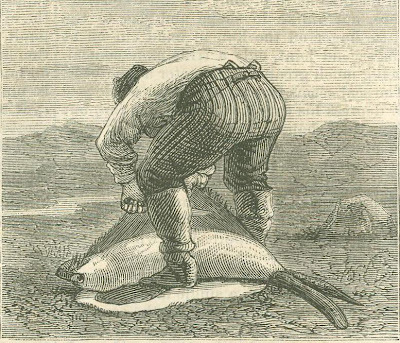 The great mortality among them must result from attacks of numerous enemies known, such as sharks, etc., and probably many oth­ers unknown, which must play sad havoc with the clumsy young seals when they are sleeping out at sea; for did this seal life not have some such check upon it, in com­mon with all other animal life, the waters of Behring Sea and all contiguous shore land would not have been able to have contained it. It is quite certain that the seals on these islands are neither more nor less numerous today than they were before they were first discovered. 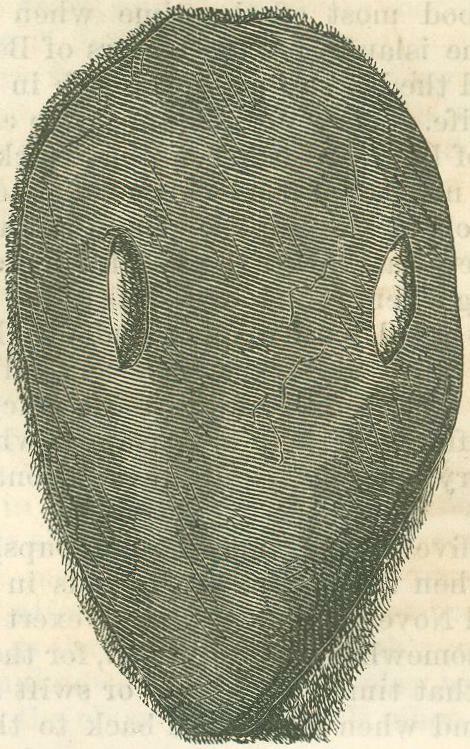 In closing this brief paper it may be well to mention the existence of two forms of seal life on the Pribylov Islands other than the one just spoken of, viz., the hair seal ( Phoca vitulina) and the sea-lion ( Cumetopias selleri), and, widely apart from them, the walrus (Tri­chechus rosmarus). The hair seal is the common form, and fa­miliar to most of the readers of this article, and upon it the popular idea, and scientific too, for that matter, has been based as to what all seals are like or should be. In this way a very erroneous impression has been ob­tained of the fur seal's appearance and hab­its. The hair seal comes to these islands in a shy, wary manner, touching the remote rocks and beaches, only never in numbers to exceed forty or fifty. It is not polygamous, and there is no difference in size between the male and female. As indicated by its name, it is without fur, but is exceedingly hardy, and fond of being around and on ice floes and cakes. It is incapable of moving on land with any freedom, and cannot car­ry its head and neck erect, although it can flounder over the beach with considerable speed when excited or alarmed. Instead of the big flat flippers or fins of the fur seal, destitute of hair, it has webbed paws and feet, with the nails on both well grown and distinct. It has no external ear, and search must be made for the opening into the meatus externus before it is observed; the eyes are large and exceedingly handsome, the head being, however, rather short and flat, with a pug-nose. The skin of the hair seal pos­sesses little commercial value, and as they exist in small numbers over the whole ex­tent of the great North Pacific and Behr­ing Sea district, they are of no importance whatever in connection with the fur trade of Alaska. The sea-lion more closely resembles the fur seal in form and habit, but is still quite widely different. It is the largest of the group, being over eleven feet in length, males weighing, when mature and fat, at least 1200 pounds. It is polygamous, having usually eight to twelve females, which are about half the weight of the males, and not over eight or nine feet in length. Not over twenty-five or thirty thousand will be found on the isl­ands, but it is not restricted, like the fur seal, to this land alone. Much might be said of this animal, and of the uncouth, walrus, but our space will not permit. from Harper’s New Monthly Magazine, May 1874.